Is Microfinance Pushing the World’s Poorest Even Deeper Into Poverty? Dhaka—In August, Bangladeshi police broke up a ring of human organ dealers operating in Joypurhat, a district in the north of the country. Investigators say that three local “brokers” preyed on a large pool of indebted farmers, who agreed to part with a kidney or a chunk of their liver for a couple thousand dollars—enough for them to pay down their debts. Mosammat Rebeca and her husband sold their kidneys to help pay back 180,000 taka ($2,358) owed to five separate lenders—a massive sum in a country where the per capita annual income hovers around $1,700. Rebeca’s husband was paid 135,000 taka ($1,768) for selling his kidney last year, but it wasn’t quite enough. “We were about 65,000 taka short, so I had to donate my kidney as well,” she told me in a recent interview. Rural indebtedness is as old as the earth in South Asia, but what was notable in this case was its source. Instead of the usurious village moneylenders of old, many organ sellers say they were victims of a new, apparently virtuous, engine of economic empowerment—microfinance. While such micro-loan programs have been widely touted as a ladder out of poverty, they had become a crushing burden for many in Joypurhat, who spoke to me of entangling webs of debt and the aggressive tactics of NGO debt collectors. Indeed, stories like the ones I heard in Bangladesh speak to a larger backlash, both on the ground and in the academy, against the practice of offering micro-loans as a tool for international development. While the majority of microcredit institutions are doubtless well-intentioned, in many places an unregulated and overzealous lending market has led to rashes of personal indebtedness and desperation that are a far cry from the development outcomes originally envisioned by experts and donors. Bangladeshi critics say that MFIs have simply acquired too much power and made far too many irresponsible loans, constituting an unregulated shadow state within the country which, far from alleviating poverty, has worsened the situation of the rural poor. “Microcredit is discrimination against the poor, it doesn’t empower. It’s total nonsense,” said Farhad Mazhar, the managing director of UBINIG, a Dhaka-based alternative development organization. According to unpublished research conducted by UBINIG, only around 8 percent of the micro-borrowers surveyed ended up using their loans to build wealth. Even then, Mazhar said, individual success owed more to pre-existing entrepreneurial skills and family support than to the credit itself. “Most of them became poorer,” Mazhar contends. Skepticism of microfinance and its benefits, meanwhile, has migrated to the academy as well. Lamia Karim, an anthropologist at the University of Oregon and the author of Microfinance and Its Discontents, has questioned the claim that offering small loans directly to Bangladeshi women has been empowering. On the contrary, she has found women are often pressured to hand over loans to their husbands or male relatives. At the same time, microcredit agencies have created what she terms an “economy of shame,” in which the traditional role of women as bearers of “family honor” is used to leverage repayments—a key yardstick of MFIs’ success. 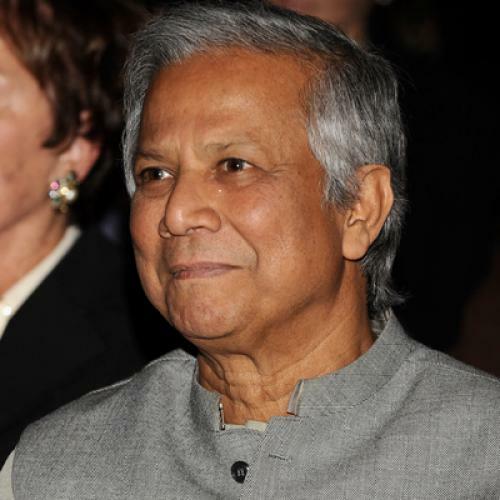 (Grameen, for instance, proudly trumpets a loan recovery rate of close to 97 percent). To avoid the public shame of default, many women take out additional loans from different lenders, and quickly find themselves mired in a quicksand of debt. This dearth of evidence can be explained partly by the challenges researchers face in isolating the effects of microfinance operations, but it also demonstrates a tendency for international donors to see what they wanted to see. Indeed, microfinance has a seductive logic on paper: Unlike the older “hand-out” model of international development, MFIs promised to be self-sustaining engines of micro-development, and Yunus—an urbane globetrotter backed by a strong lobby of international supporters—was the perfect salesman. “People were looking for some sort of silver bullet that alleviates poverty and empowers women, and they thought credit was the answer,” Duvendack said. The ensuing explosion of popularity has arguably pushed aside developmental alternatives, including programs to boost agricultural productivity and skills training, that could have contributed to the fight against poverty. While admitting that access to credit is a handy tool, Mazhar of UBINIG argues that microfinance had been elevated into a shibboleth of market-based theories of development that encourages the withdrawal of the state from rural development in favor of the “village entrepreneur.” Taken on their own, MFIs have failed to alter the feudal economic structures in rural Bangladesh, something that can only be achieved by boosting agricultural productivity. “The machine that produces the poverty—you’re not trying to change it,” Mazhar said. BUT IF MICROFINANCE has doubtless been oversold, other experts say the growing backlash is in danger of overcorrecting. Dean Karlan, an economist at Yale and the author of More Than Good Intentions: How a New Economics Is Helping to Solve Global Poverty, observed that much of the opposition has stemmed from an “irrational exuberance” about the importance of credit, but that microfinance can still offer the poor a range of valuable economic tools. In the course of his research, for instance, Karlan said many low-income clients had shown a strong interest in micro-savings accounts. “The fact is not everybody always needs a loan,” he said. “The microfinance community needs to be more client-focused, so to speak, and more focused on what people actually need.” The negative impacts of credit, meanwhile, could be partly ameliorated by giving micro-borrowers a means of taking action against over-zealous debt collectors, or establishing credit bureaus so lenders can prevent the poor from taking on too much debt. “The right answer is not to shut down the market,” Karlan said. Sebastian Strangio is a journalist based in Phnom Penh, Cambodia, who reports widely on the Asia-Pacific.